Famously known as “Auld Reekie” thanks to the smoke that belched out of some 40 breweries around the city centre, Edinburgh was often in a haze of sea mist and brewery smoke – not the most health-friendly or eco-friendly image. Edinburgh has made some progress since then, with only has one brewery remaining, the Caledonian Brewery, that leaves the distinctive sweetness of yeast in the air without the low, heavy clouds of smoke that used to accompany it. The printing presses at one of Edinburgh’s most well known buildings, The Scotsman, were switched off long ago. With the shuddering of rolling presses, an interior as smoky as fumes pouring out of the chimneys, and reporters fiercely click-clacking on typewriters, it was not the picture of eco-living. It is now a fancy hotel, click-clacking with the glamourous stilettos of Edinburgh’s elite. HRH Prince Charles visited the city’s sustainable projects this year, heading North of the border on his now infamous “green train” which runs on cooking fat, apparantly producing just one eighth of the CO2 emissions of regular diesel. So from pedicabs to porridge bars, Aberdeen Angus steaks to Arthur’s Seat, Edinburgh is slowly but very surely, going green. From the airport, there are two options – a pricey taxi or a speedy £3 bus service into the centre. Tip: If you choose the pricey option, don’t ask the taxi driver when the tram system will be finished; traffic has been diverted and roads ripped up, whilst funding has disappeared, reappeared and vanished again; all of which has culminated in almost two years of apoplectic rage from Edinburgh’s usually good natured cabbies. When completed, however, it will provide a leaner, greener transport system for the areas of the city it serves. For the rest of the city, there is still a very comprehensive network of buses, which at £2.50 for a day pass, is a relatively cheap way to get around. Arriving into Edinburgh by train is arguably the best way to first see the city. The railway tracks pass down a narrow gorge between Princes Street and the Castle, bringing you right into the very centre. Tickets are as cheap as £25 from London if you book ahead, with £15 upgrades to First Class on a Sunday. Pedicabs are increasingly common, although a brave option in the winter. If you fancy making a quick buck, they can be hired for around £100 for the weekend from B-Spokes, and if you’ve got a strong pair of thighs, the gift of the gab and don’t need much sleep, you can make up to £500 in 48 hours. Walking is by far the cheapest and greenest way to see the compact city centre. Leave your umbrella at home, and pack a woolley hat instead. Nothing screams tourist louder than an umbrella blown inside out. High Street hostel is now Carbon Neutral after buying 75 hectares of woodland which absorb more CO2 than the hostel’s fuel emissions produce, and is an excellent, popular budget option, whilst Straven Guest House in the seaside suburb of Portobello and Ten Hill Place in the Old Town are just as eco friendly, but a little more swept up. Coffee Etc or Kilamanjaro are personal favourites for a fair trade caffeine hit, homemade cakes and wraps. Victor Hugo is the bright red deli on the corner of The Meadows which stocks its shelves from small local producers. For ethically sourced, organic, local produce, treat yourself to dinner at Iglu, Pickled Green, or Number One at the Balmoral. Every Saturday morning, Edinburgh Farmers’ Market takes place on Castle Terrace. Here, specialty organic producers of meats, wines, cheese, knitwear and spirits jostle for business opposite Princes Street gardens and the Castle on the hill. Northern Country Lass sells pies that HRH Prince Phillip is a big fan of, while Well Hung and Tender sells out of its Aberdeen Angus beef week after week, and Scotts Porridge runs the World’s first porridge bar. If you’re looking to bag a bargain, the rails in the charity and vintage shops on South Clerk Street and the Grassmarket are an excellent place for some thrifty trawling, especially the second hand cashmere jumpers in Armstrongs. More and more independent eco friendly shops have started to open, and stay open. Joey D designs and creates clothes fashioned from recycled ones, Bliss Studio sells worn-once wedding dresses and there’s plenty of eco-eroticism at Organic Pleasures. Edinburgh is a very green city in the most literal sense. 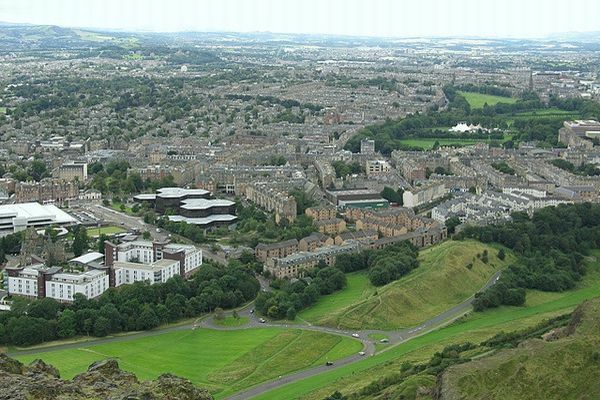 The city’s landscape is dominated by Arthurs Seat, formed, like most of Edinburgh’s undulations, from an extinct volcano. The castle, one mile to the East, sits atop the volcano’s plug. Arthurs Seat is West of the Old Town, in the middle of Queens’ Park, so named as it backs onto Holyrood Palace, and because Queen Elizabeth II still owns it. At 250m high, it only takes about 40 minutes to reach the summit and it’s an easy walk. From the top, you can look North over the Firth of Forth to Fife, south to the Pentland hills, east to the Castle and west to the coast. On a summer’s evening, Princes St Gardens in the city centre and The Meadows in the Southside of the city will be filled with students, suits, tourists and families. As of summer 2010, barbeques are permitted in the Meadows. Be sure to aim for one of the designated concrete slabs. Gather friends, buckets of Corona and an enormous Aberdeen Angus steak or two. Running is very popular amongst the hardy residents of Edinburgh. The Great Edinburgh Run, Edinburgh’s only full marathon, takes place in May. The student-run Meadows Marathon is fancy dress gold, with competitors running nine times around The Meadows to complete the half marathon. One of the most popular events of the calender is the Great Scottish Santa run around Princes Street gardens. The best bit is getting to keep the full Santa suit afterwards. Check out more Green Guides at Matador’s Green/Sustainable Travel page!